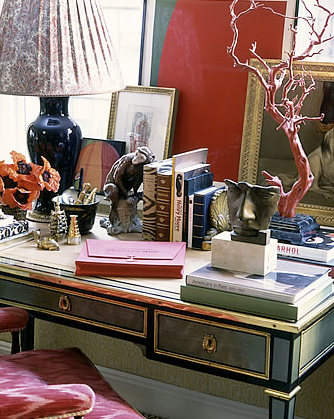 One of the TOP thirty Decorators according to Elle Decor is Alex Papachristidis, personally, I'd like to define his fabulous and unique style as Cluttered Perfection. 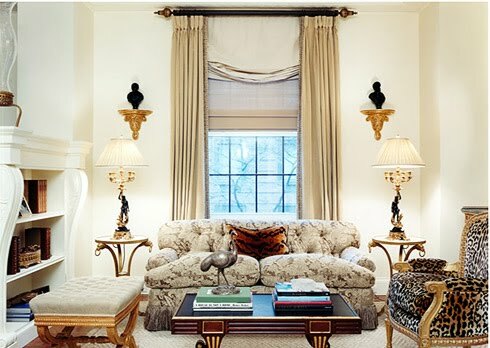 Papachristidis is fearless, in his use of pattern, he is elegant, his interiors are luxurious, sensual and over the top. They are overwhelming inspiration! 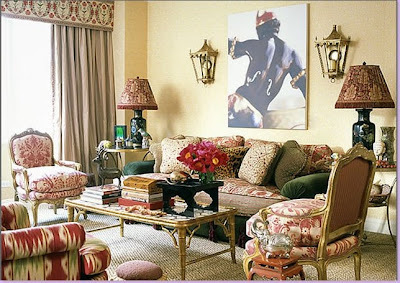 You see, my beautiful friends, his work has been described as a dynamic fusion of the modern and eclectic with the luxurious and traditional. I agree 100% on that one! However, says his web-site that some Editors, designers and clients use the word “fresh” to define his approach but I disagree there, his style is anything but fresh... which is not necessarally a bad thing, some of us enjoy the pattern mix, the saturated spaces and the rich palettes with luxurious touches. If I was to define his style in one word it would be "Rich". Of course Papachristidis’ interiors can be found all over the world from Manhattan, the Hamptons, Connecticut, Florida, Texas and Colorado—to London and Saudi Arabia.With a creative layering of patterns, embroidery and sisals; A mix of modern and 18th century furniture, old world prints, silk velvets and chinoiserie. I know this is a style to either LOVE or HATE. What's your take on the "Cluttered Perfection"??? gee it's almost a bit "versace" isn't it! very grandiose! I don't mind it, i don't think I could live in it - too busy... but would be nice to know someone who lived this waY! hey guys!!!! I know, i love some spaces and in others, feels like a bit too much. xoox!